Many probably think this disc is another Hawkwind compilation. It’s not, though. Other than a reworking of the Hawkwind classic “Sonic Attack” that serves both as the title track and its opener, everything here is completely new. There is some extremely strong music here, and I’d have to say that while this isn’t the band’s best disc, it might be one of the most consistent. Truly the sound of the group in the 1980’s was infectious and accessible. These guys rocked out in a way that could really catch you up in it, but still managed to keep the space age spirit of psychedelia alive. This might not be one of the more obvious choices from Hawkwind’s catalog, but it’s without question one you should not pass up. This is a reworking of the old Hawkwind piece of weirdness. It’s got an updated sound, but isn’t a huge departure. It’s always been an odd track, and seems even stranger as an opener. Coming straight out of the insanity of the previous path, this is a killer hard edged Hawkwind jam. It’s not a huge departure from the rest of their material of the time, but it’s definitely a strong tune and has some scorching guitar soloing and tasty keyboard sounds. There’s also a cool fast paced bass driven jam later that’s full of drama and power. A crazed recitation of some non-sensical spelling starts off this one. There’s a major intensity to this keyboard dominated early section. It’s like there is some serious importance to the message being delivered. They power it up into another hard edged jam and this just plain cooks, even though it doesn’t stay around long. The music that makes up the backdrop for this number is dramatic and pretty, but yet rather creepy. The poetic lyrical recitation is in much the same vein. It’s got an processed texture and feels decidedly non-human. Of course, since the most prominent line is “we are the un-dead” that’s appropriate. This is taken into some seriously strange musical textures after the voice goes away. Dark and powerful, this is a very strong Hawkwind number. It has a considerably potent instrumental break. This rises up with a classic hard rock jam and it seems like the band have been playing for some time and we’ve just walked into the room to hear it. The chorus on this is catchy and the track might be stereotypical of that era of the band, but it just plain works. They throw a couple changes our way before they bring this to a halt. It fades out much as it faded in to start. “Coded Languages” is a special effects laden cut with spoken, nearly screamed, words. "Question the nature of your orders!" 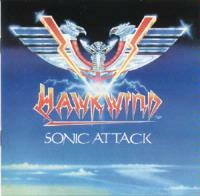 It splits off into a strong rocking cut that is very strongly based in traditional Hawkwind modes. This is a considerably strong song that covers a lot of various Hawkmodes. Hard edged and with a rubbery nervous sounding sort of riff, this is another killer Hawk-classic. There is an awesome, keyboard dominated, instrumental movement later in this cut. We also get some especially tasty guitar work. As strong as this disc is, this is one of the highlights – and that says a lot. This cut feels in a lot of way like a sequel to “Living on a Knife Edge,” but if you listen very carefully to the background there are hints of “Paranoia,” going all the way back to the first Hawkwind album. It’s a good track and a solid way to end the disc in fine fashion – despite the bleak message. A cool drop back to ambient territory with a spoken word segment is a nice touch, but when it fires back out we also get some killer guitar soloing.